This special mountain and sea program is a hands-on cooking program designed for those who love traditional Italian cooking and long to learn how to make the lasagnas, cannelloni pastas, cakes, and cookies their nonnas used to cook. Join Mamma Gabriella and her daughter Maria in their Italian kitchen in Agerola, perched atop the Lattari Mountains, high above the Amalfi Coast, and discover the secrets behind the simple but delicious cuisine that have delighted generations of Italians. Be immersed in the spirit of Southern Italian sea-meets-mountain cooking where you will create a complete menu of delicious dishes hailing from Agerola under your chef's guidance. Your Italian cooking holidays is hosted at our country house style bed and breakfast in the small town of Agerola on the Amalfi Coast. The country house is surrounded with an attractive garden where guests can relax in the shade of a tree in the company of a good book in the lovely gazebo overlooking the ocean, having a sun bath, taking a warm shower, relaxing on the chaise, or drinking a glass of fresh prosecco. As the sun begins to set, sip a cool apperitivo on the big terrace overlooking the blue sea and the brightness of the moonlight under the stars. Around you, are chestnut trees, fig trees, perfumed jasmine, beautiful geraniums, flowering lavender, and a collection of terracotta pots dripping with rosemary bushes, mint, herbs, and flowers. Each bedroom has a terrace or balcony offering enchanting sea views. Vietris ceramic tiles line each bed room. All rooms have a private bathroom with a shower and hair-dryer, and a TV. Breakfast is served each morning in the smartest breakfast hall that included dining area. Wi-fi internet and daily maid service is provided for your convenience. Arrival and check in. Pick-up and transfer to property. Check into your room, meet your hosts, and review your program. Later in the evening, a welcome dinner is scheduled. Dine on the chef's tasting menu featuring fresh seasonal ingredients. Local wine and coffee are included. Early morning departure for the marvelous archaeological ruins of Pompeii. Return to Agerola. In the afternoon, your first hands-on cooking class. It starts with an introduction and overview of the week after which you will prepare traditional hand made pasta, bruschette with home grown vegetables and herbs, tagliatelle with slow cooked Neapolitan rag, and a tasting of Caponata with tomatoes, olive oil, basil, origano, and pane biscottato accompanied with a selection of fresh and mature cheeses and a delicious gelato. Dinner follows and everyone eats the foods that were prepared in class. Toast with a glass of red or white wine and finish with a coffee. In the morning, visit to the traditional mozzarella producers of Agerola to see how they make the areas delicious fior di latte cheese. *Tasting included of mozzarella and other delicious local cheeses. These products are part of Agerola's gastronomic history, and in fact, Agerola is located on the slopes of I Monti Lattari. In the afternoon, roll up your sleeves and get ready for your second hands-on cooking class. You will be making zeppole agerolesi, traditional deep fried fritters made by hand, paccheri pasta with eggplant and shavings of the local cheese provolone del monaco, and chicken with lemon and potatoes. Dessert today is tiramisú. Dinner follows and everyone eats the foods that were prepared in class accompanied with a glass of red or white wine and finished with a coffee. Morning free to explore the pretty town of Agerola. In the afternoon, you will have your third cooking class. No doubt youll have worked up a real appetite after your trek, so you will be eager to get started. Today, you'll be making linguine with porcini mushrooms, followed by veal scaloppine cooked in white wine and stuffed vegetables. Finish with lemon cake. In the morning, visit to one of the most important local wineries Cantine del Vesuvio to discover their precious red and white wines, many of which are produced from ancient varieties of grapes. Tasting included. Return to Agerola. In the afternoon, you will have your fourth cooking class. You will be making the famous and delicious gnocchi alla sorrentina with tomato sauce and mozzarella, pork loin in white wine, and a selection of grilled vegetables, all of which will come from Gabriella's vegetable garden. Dolce today is ricotta and pear tart. In the morning, visit a gifted local potter who makes beautiful hand-painted ceramics. In the afternoon, you will have your fifth cooking lesson. Get ready to prepare cannelloni stuffed with ricotta and buffalo mozzarella, ribs and pork chops grilled served with vegetables, and a delicious local gelato. Lunch and evening free to dine on your own. Buried under burning ashes with the eruption of Vesuvius in 79AD, only to be rediscovered in 1748, today Pompeii is one of Italy's principal tourist attractions and is a UNESCO World Heritage Site. Every facet of ancient Roman life is revealed here: the style of their houses, recreational habits, the city's art and culture and even taverns where men would have stopped off for a drink of wine and a dish of olives. Mosaics, frescoes, terracotta amphora, and casts of townspeople and animals caught in the eruption all make for an absolutely fascinating visit. The bed and breakfast is situated in a wonderfully panoramic position spanning over the Mediterranean with views of the Amalfi Coast. From its big terrace, you can look over the bay of Conca dei Marini and over the Calabria Coast. During the cool summer nights, you can watch the sky with a powerful binocular where you can see Jupiter, Saturn, the Planets in a wonderful prospective. During the day don't miss an oxygenated walk through the pathways that takes you to the most amazing and unforgettable sights. In just 200 meters you can walk to the old Lauritanos Castle, from which you can see all of the Amalfi Coast, Ravello, Scala the little Pontone, Minori Cetara famous for the fresh angiovies, Maiori Salerno, all the Cilento coast till Calabria. At only another 200 meters. you can visit the ancient Colonia Montana, a ruin of the Mussolini period from which you can admire an amazing panorama of all the Path of the Gods and the Sorrento Peninsula till the Isle of Capri with Faraglioni and the Isle of Galli, an protected sea area under UNESCO, you can imagine how gorgeous it is. All cooking classes take place in Gabriella's country kitchen and each class will include the preparation of a full menu. Discover wonderful local products and cooking traditions, and watch carefully as Gabriella guides you through lessons on handmade pasta, delicious Cannelloni, Tagliatelle, gnocchi, spaghetti, orecchiette, and pasta with porcini mushrooms. Try your hand at preparing traditional veal dishes, chicken with lemon, ribs and pork chops roasted on the grill, beef, and sweets like fried chestnut zeppole, lemon cake, tiramisu and ricotta and pear tart. Explore the town of Agerola and head to one of the view points for breathtaking panoramas over the coast including the towns of Amalfi and Praiano. For the more adventurous, why not consider taking a trek through the Path of the Gods. Leaving from Bomerano in Agerola, this trek leads you through some of Italys most stunning countryside, along paths and trails cut into the dramatic Amalfi landscape high above the Mediterranean. Perhaps you will want to spend some time in Amalfi and enjoy lunch at a waterfront restaurant. 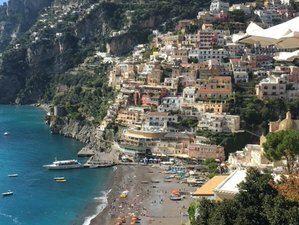 Or what about a day spent exploring the winding streets of Positano with its striking tumble of pastel colored houses clinging to the cliffs, its cathedral, beach, and pretty boutiques. For pottery lovers, a day spent at Vietri Sul Mare is ideal. Here, you can stop off and watch artisan potters in their workshops, and even order a dinner set of distinctive local pottery, as most artisans offer international shipping. You can also go with private boat to Capri for your free day or make a little cruise around the Amalfi Coast in a private boat, starting from Minori with the visit of Pandora grotto, then Amalfi from the coast, Natural Arch in Conca dei Marini, Sophia Lorens Villa, emerald Grotto, Furores Fiord, the Isle of Galli, and to spend 3 hours on a little beach having your lunch pack, that includes toast with salad, mozzarella, ham, and beer or wine, for a relaxing day under the sun. The closest airport is the Naples International Airport (NAP). The closest station is Napoli Centrale only 45 kilometers from Agerola. Alternatively, it is also possible to catch a ferry or hydrofoil from the Beverello pier Naples to Amalfi from where you can then take a bus or taxi. Whether coming from north or south of Naples take the A3 Napoli-Salerno motorway and take the exit for Castellammare di Stabia and then continue in the direction of Agerola/Amalfi along the SS 366 motorway. When you have arrived in Agerola follow the sign for San Lazzaro. At 300 meters to the square Generale Avitabile you will find the Nest of Gods. Bed & Breakfast close to Amalfi Coast. Historic Italian Villa renovated in 2006 with 9 rooms, ceramic floors. Italian cooking tours.